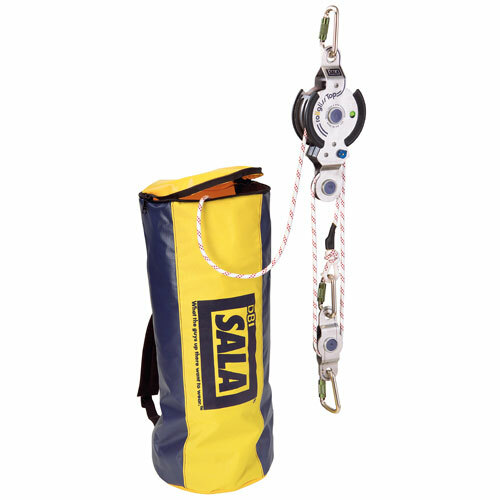 The Rollgliss R350 is a modular ascending and descending rope system that sets new standards of performance in the safety and rescue market. The system excels in handling, technology, function, safety, and versatility--even under the most difficult of conditions. The R350 is the result of years of experience in the manufacture and practical use of safety and rescue systems, and has been examined and tested in adherence to the very latest regulations. The device is pre-rigged so it can be deployed quickly right out of the bag. The system is also completely customizable by adding optional pulleys. The unique coupling system allows for quick, easy insertion of various fixed deflection pulleys enabling the user to change the mechanical advantage for added jobsite versatility and safety.